VetHelp is a web based application that provides easy access to resources needed by homeless veterans and the people that help them; when they need it and where they can get it. VetHelp was designed with the homeless veterans of Monmouth County, New Jersey in mind. However, veterans all over the United States should find it useful. VetHelp is a multi-platform application. It can be used from the web browser of any Android or iPhone compatible smart phone or tablet. VetHelp can also be used from the web browser on most (if not all) desk top computers. 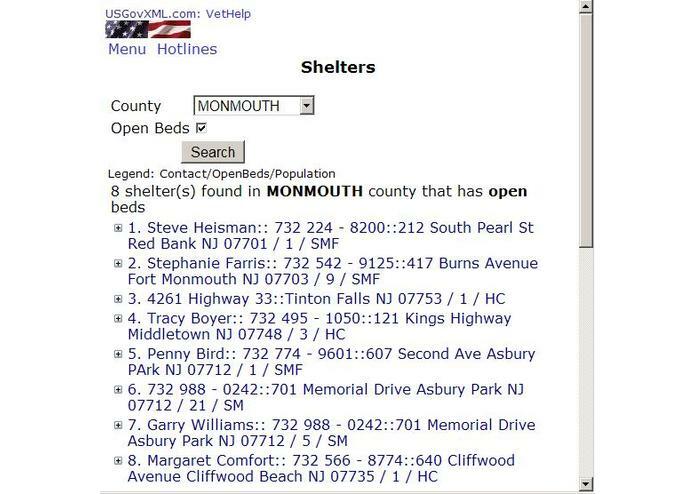 Search For Shelters VetHelp provides the ability to search for shelters located in any county in NJ and whether or not the shelter has open beds. After selecting a county and whether or not the search should include only open beds, VetHelp will search for shelters matching the search criteria. Data for those shelters matching the search criteria will be displayed; those that are nearest to the JBJ Soul Kitchen appearing first. In addition, a map showing the nearest shelters will be displayed. Data returned for each shelter includes contact information, the name of the shelter, the name of the program and the type of population it serves. 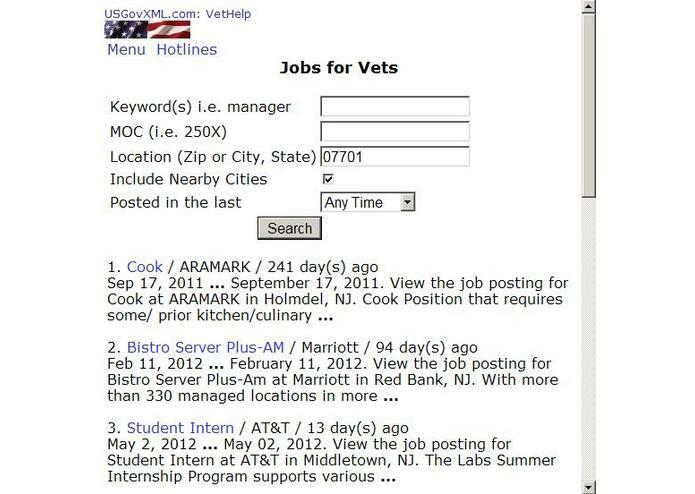 Search For Jobs VetHelp provides the ability to search for jobs based on keywords (i.e. manager, software developer, etc.) and/or MOC and/or location and/or when the job was posted. In addition, the user can search for jobs in nearby cities. The data returned for each job includes the job title, the employer and the age of the job posting. Additional details about the job can be obtained by clicking on the job title which will open a window to the site that is sponsoring the job. Search For Attorneys VetHelp provides the ability to search for attorneys that are currently accredited by the VA to represent VA benefit claims. Users can search by City and State, County and State or within a specified radius of a zip code. 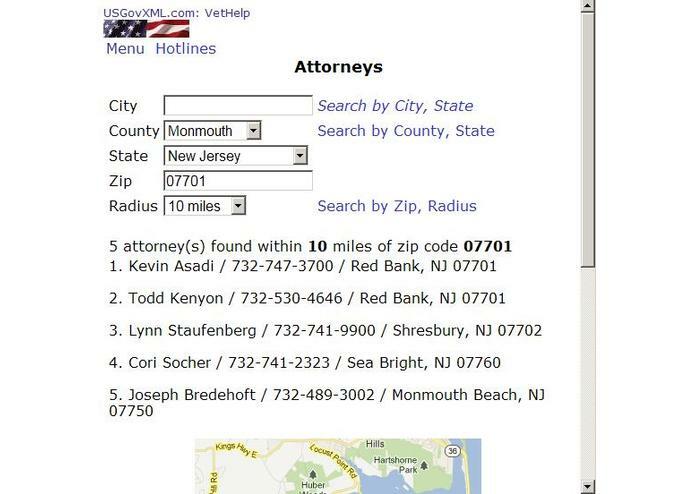 A map showing the location of the nearest attorneys is also displayed. Search for Transportation Facilities VetHelp provides the ability to search for transportation facilities for disabled veterans by state. 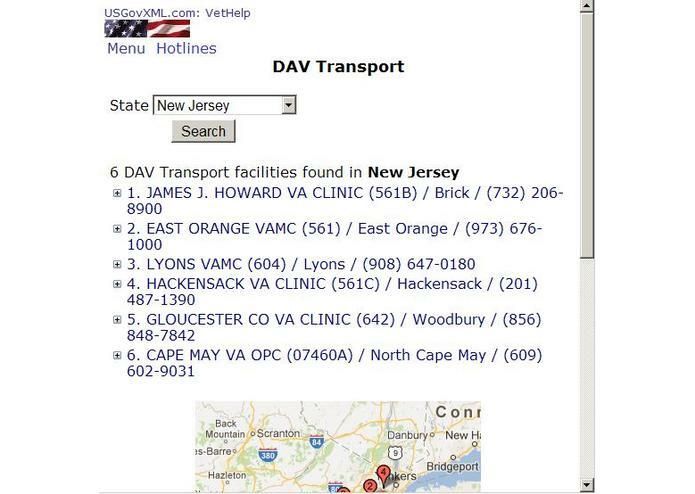 Through the Transportation Network, DAV volunteers drive sick and disabled veterans to and from VA medical facilities for treatment. A map showing the location of the nearest transportation facilities is also displayed. Search For Mental Health Facilities VetHelp provides the ability to search for mental health facilities by state, city and state, county and state or within a specified radius of a zip code. The data returned includes the name of the facility, the city in which it resides, the telephone number and the name of the coordinator. A map showing the location of the nearest mental health facilities is also displayed. 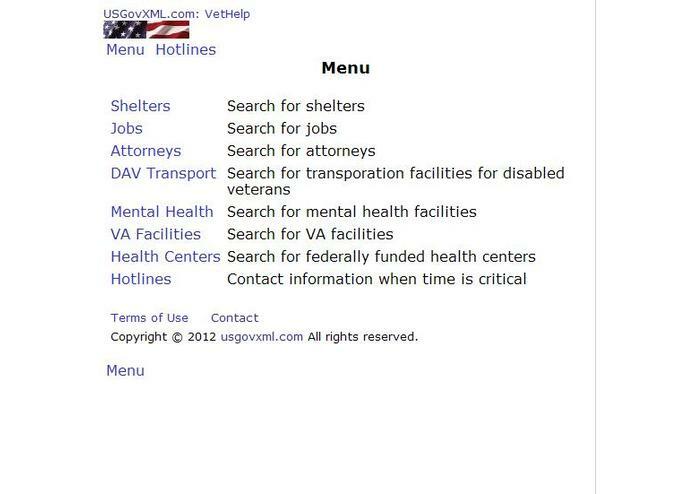 Search For VA Facilities VetHelp provides the ability to search for VA facilities by state, city and state, county and state or within a specified radius of a zip code. The data returned includes the name of the facility, the city in which it resides, the telephone number and the name of the coordinator. A map showing the location of the nearest VA facilities is also displayed. Search For Health Centers VetHelp provides the ability to search for federally funded health centers within a specified radius of a zip code. The data returned includes the name of the health center, its approximate distance from the zip code, its address and web site. A map showing the location of the nearest federally funded health centers is also displayed. Hotlines Provides contact information when time is critical. Visit USGovXML.com to discover other interesting and useful publicly available XML data sources and web services provided by the U. S. Government.